While wondering whether if our advancing robotic and online technology needs to slow down to give security and privacy controls a chance to catch up for our protection, it is interesting to note the following. WHAT KIND OF NATIONAL SECURITY do we have when Harold T. Martin III, a 51-year-old NSA contractor, can take classified files home for 20 years, with 50 terabytes of info, without being caught? Donald Trump, if we suffer the misfortune of seeing him elected, could build the biggest wall in world history on the Mexico border and it wouldn’t make a difference in these type of dangerous security breaches right under the NSA noses. EVERY TIME COMPUTER SYSTEMS are in the news for getting hacked into, I wonder what the rush is to develop robotic, self-driving cars and rely more and more on self-thinking technology that seems susceptible to being taken over. YOU HAVE TO FIGURE technology people behind the TV shows “Mission Impossible”, many decades ago, were on the right track when the instruction messages on the tape recorder for the agents self-destructed in seconds after being played. The first email server provider that comes up with a timed destruction option that wipes out, in seconds, all traces of a message from memory and Internet existence, would make billions of dollars. IN MASSACHUSETTS, THE POLITICAL BUREAUCRATS are taking bows, congratulating themselves for replacing all the toll booths on the Mass. Pike and eliminating over 400 full-time jobs. They insist, after commuters navigate through several months of chaos while the booths are coming down, that the change means fewer traffic slowdowns, less air pollution and safer driving conditions. What they don’t say is people will be driving at even higher speeds over the limit and the government will be developing the capability through technology to keep track and compile records of where individuals travel and when. The political hacks will switch from giving each other high-fives to finger pointing if the electronic billing gets tampered with and the system crashes. HAS THERE BEEN A PRESIDENTIAL CAMPAIGN in the modern era that has generated fewer campaign signs and bumper stickers? That is one pretty obvious example of the low regard and lack of enthusiasm the public has for Trump and Hillary Clinton. CHRIS WALLACE SURPRISED MANY VIEWERS with his superior job moderating Clinton-Trump Debacle III. The fact he works for Fox, a right-wing biased entertainment network masquerading as a news outlet, does not diminish the fact Wallace is a terrific journalist. If he was an anchor on CBS, ABC or NBC, he’d be a respected household name. ROBBIE MOOK, HILLARY’S campaign manager, wins the Smile of the Year award for being able to project a grinning face 90 percent of the time when on camera. The tougher the question he faces, the wider the smile, accompanied by an “I am glad you asked that. This is something that needs to be asked.” Or, ”That is a great question." It would be interesting to know what he is really thinking. If he doesn't play poker, he's missing a great chance to make a fortune. As bad as the news for Clinton’s camp that the FBI was reopening the investigation into Hillary’s emails, Mook was still able to keep a stiff, upper lip on his smile. ON THE PLUS SIDE, this presidential election provides the perfect tonic of youth, restoring relevance to SNL. Just when Saturday Night Live appeared tired, worn out and practically obsolete, this strange, often absurd political campaign has supplied the show with fresh, new material. Must of the comedy sketches related to the campaign, especially those mocking the debates, have been hilarious. ALTHOUGH THIS IS THE ULTIMATE IN CYNICISM, I have to say these two candidates carry so much baggage the winner of the election could, in the long run, be the loser. Hillary Clinton's toxic dripping of embarrassing emails is not going to end after the election and she figures to have distracting and stressful investigations of her careless and decadent way of doing business haunt her through her term in office. For Trump, a victory would mean making a complete fool of himself as he deludes himself into believing he is a popular dictator who can run the country without a trace of tact, wisdom, poise and judgement. The loser of the election can relax and second guess everything from a safe distance. Trump, if he loses as expected, projects to be the worst sport of all time in defeat. He will revel in holding court with his band of loyal negativists, blaming defeat on a rigged system. Hillary, if she loses, can become a high-paid computer consultant for the Clinton Foundation or Wall Street. THERE’S MUCH IRONY in the fanfare and jubilation surrounding the return of the Chicago Cubs into the World Series national spotlight. It’s true the Cubs draw much sentimental support because they had not won a Worlds Championship since 1908. The real reason, however, for the team’s huge national following goes back to the early 1980s when Chicago’s WGN was a superstation broadcasting almost every single Cubs game as cities and towns throughout the nation were being wired for cable TV for the first time. 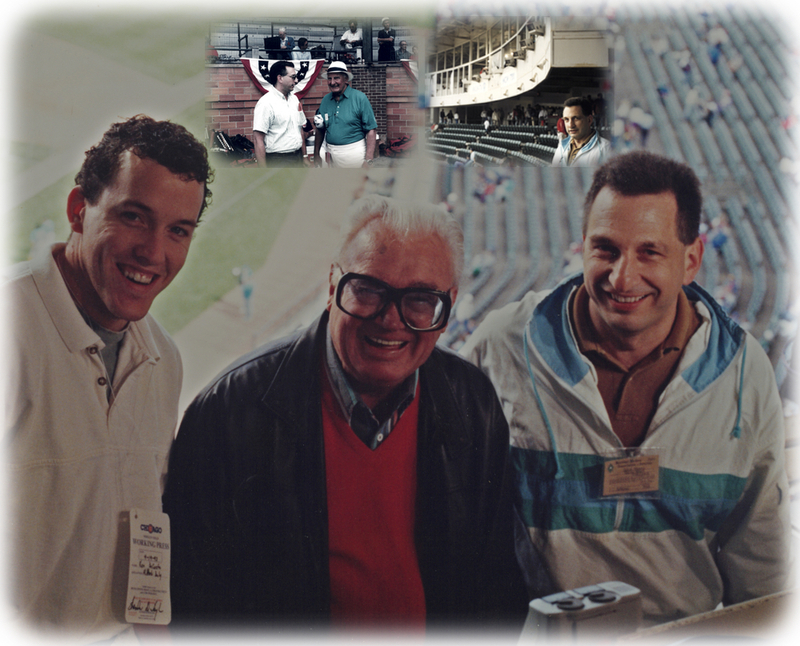 The colorful, exciting and charismatic Harry Caray, paired with the great baseball color man Steve Stone, introduced the charm and ambiance of Wrigley Field day games to millions of new fans. All the home games were played in the afternoon and fans all over the country, coming home early sometimes from work, would watch day baseball in a stadium with a hand-operated scoreboard and old-fashioned organ music. Beginning in 1984, with upcoming stars like Ryne Sandberg, the Cubs began playing exciting, competitive baseball. The audiences, with Caray’s unique and straight-from-the-heart-of-a-fan commentary enhancing the game action, continued to grow. Sadly, Caray died in 1999, Stone jumped over to the White Sox, WGN became strictly local and the Cubs now play mostly night games. The real tragedy is that all of the World Series games in Chicago this year, because of advertising and business, were scheduled at night and the national audience was robbed of the chance to witness Wrigley Field’s day-game charm and what made the team so popular in the first place. IF NFL COMMISSIONER Roger Goodell really wanted to punish the New England Patriots for the deflated football controversy, he'd have suspended Bill Belichick, the coach, for four games instead of quarterback Tom Brady. With Brady out, the Pats were 3-1. When the 39-year-old quarterback returned, he was entering mid-season well rested and in top physical shape for the stretch run. Belichick, the team's mastermind, is the irreplaceable component of the franchise and the Patriots would have struggled a lot more with him banished from games instead of targeting the marquee quarterback.